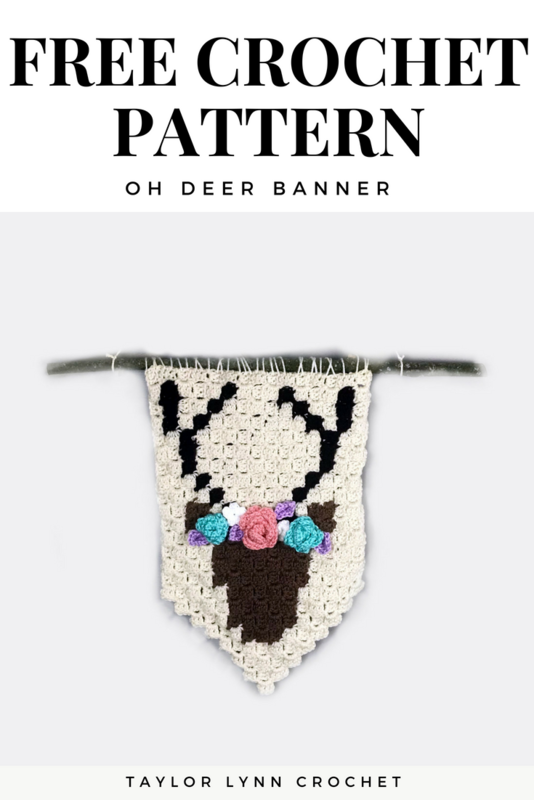 I saw a similar Deer C2C Banner on Ashley, from A Crafty Concept’s, Instagram story and immediately messaged her asking if she had a pattern for it. 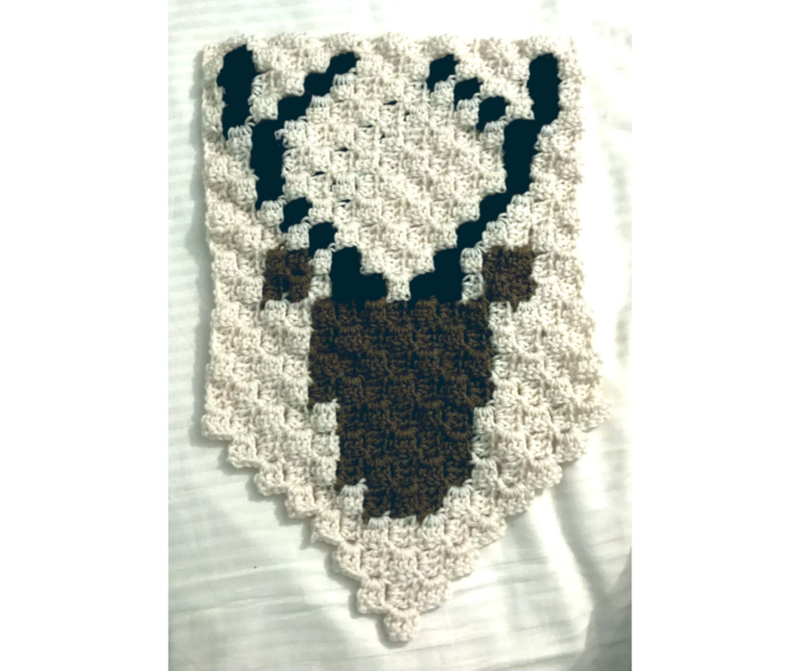 Unfortunately for me she didn’t, but fortunately for you guys I was so inspired by it that I made my own Deer C2C Banner Pattern for you all. Check out Ashley’s site, she recently released a DIY fabric pumpkin post (and a crochet one as well) that is to die for! So stinkin cute ya’ll! So some of you might be thinking “Taylor, I’ve never done corner to corner crochet before it seems difficult”, but let me tell you. I have made one. ONE! C2C washcloth in my life before designing this pattern. I am going to share a link to Jess’s AMAZING tutorials from Make and Do Crew with tons of detailed videos and posts about this stitch that I used. I looked at her picture tutorial for this stitch and was able to complete/design this pattern in just a few hours. I promise C2C crochet isn’t as mystifying as it appears! 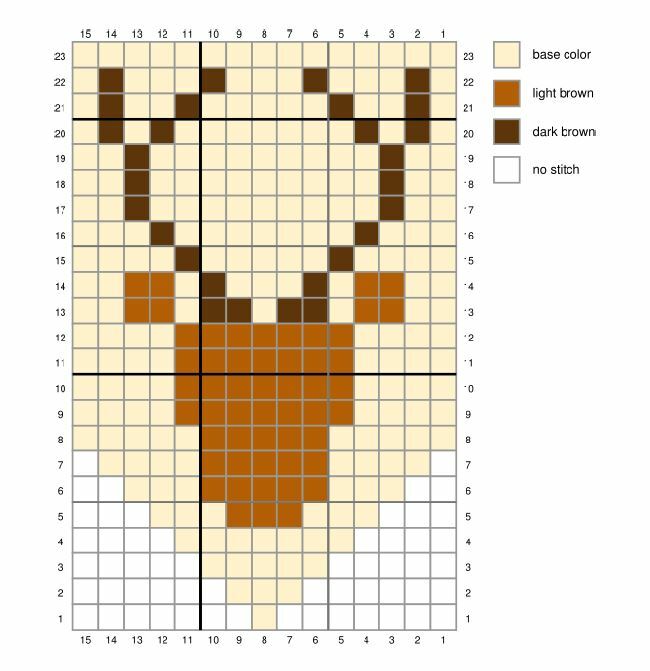 I have written directions for the Deer C2C Banner pattern as well as a graph for those of you who prefer to use the charts. If enough people message, or comment, requesting a video tutorial I will most definitely make one for this pattern! I would love to see what this pattern looks like in all the colors! Tag me in your finished projects or even if its still a work in progress and I may feature your project on my social media accounts! If anyone has a suggestion for any new patterns feel free to tag me or DM on my instagram at anytime. Also if you get stuck on a pattern at any time, just find where I posted that pattern photo on my Instagram and leave a comment with your question. This allows me to know exactly what pattern you are asking about, and it may help out someone else so has a similar question! I will respond as quickly as I can. Thanks loves! Yarn: I used less than half of each skein of red heart’s super saver yarn in a cream, tan, and dark brown color. I got it from Joann fabrics on sale as well as getting 10% cashback from scanning my receipt in my ibotta app meaning I got this yarn for around $2.30 per skein. But you can use any yarn for this pattern; I went with something inexpensive in pretty colors. I also used just random scrap fabric I had laying around for my flowers and leaves (caron simply soft). For a larger banner use a bulkier yarn with the appropriate hook size but keep in mind the gaps between the stitches will be larger. Crochet Hook: I used a 5.5mm Clover Brand Hook. Tapestry Needle: A yarn needle to weave in your ends. Stick or Dowel: To hang your banner from. Get a dowel from Amazon. Double Crochet (DC) – YO and insert hook into next chain/stitch and pull up a loop. YO and pull through all loops on hook. 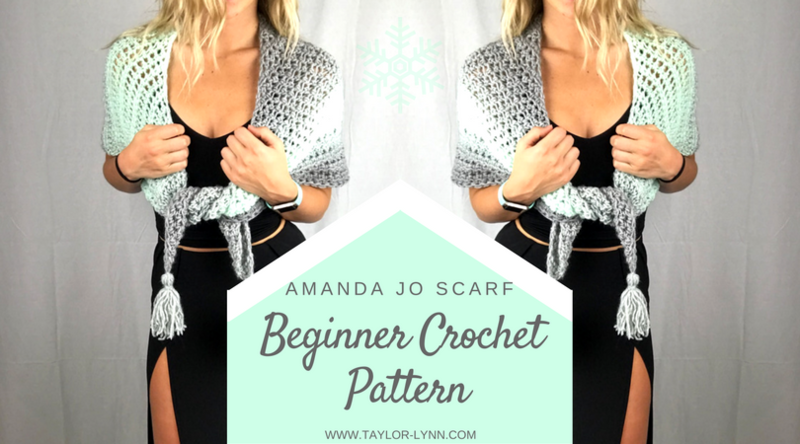 If you love this warm fall accessory then you may want to check out my Amanda Jo Scarf pattern as well! Below is just a very basic explanation of this stitch. Check out Jess from Make and Do Crew’s tutorial for extremely detailed instructions. Row 1: CH6, DC in the 4th CH. DC in the next 2 CHs. Row 2: CH 6, DC in the 4th CH. DC in the next 2 CHs. SS to the Ch3space from row one. CH 2, make 3 DC in the CH 3sp. Row 3: Ch 6, DC in 4th CH. DC in next two CHs. SS to Ch2space from previous row. CH 2, make 3 DC in the CH 2sp. SS to Ch3space from previous row. CH 2, make 3 DC in the CH 3sp. **Continue this pattern with the CH 6 at the beginning of the row for all the increase rows. **To make a decrease row, you will not CH6, you will SS back down the end of your cluster and SS to the CH2sp of the previous stitch. ** The wrong side of this pattern will be a hot mess potentially from so many color switches. I worked my yarn from both ends of the skein to cut back on the draping the yarn back and forth constantly. Jess’s tutorials have tons of tips for color changes, how to keep your yarn from twisting and tangling, and so many more life saving tips for C2C crochet! Not to mention she has tons of other great C2C patterns available, like a C2C ombre deer blanket that is supes cute! Check out this tutorial from Make and do Crew for a video tutorial on this stitch. Below is the chart for this pattern. 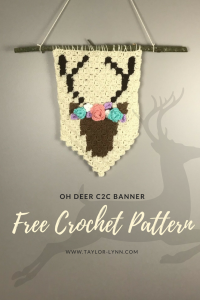 If you want a printable PDF of my Oh Deer C2C Banner chart (for color printing and black&white printing) as well as a written AD free PDF, you can purchase it here from my Etsy for $2.00. Below is what your project should look like at this point. If you want to use the dark brown yarn and yarn needle to connect the di-angle stitches on the antlers to make it look more cohesive, do that now. Row 1: SC in 2nd CH from hook, HDC, DC, HDC, SC, SC. Row 2: CH 1. Do NOT turn. Continue to crochet along the BACK of the foundation chain. Make a SC in the second ST, HDC, DC, HDC, SC. CH 3 and tie off. *CH 2, DC, HDC, SS all into magic circle* repeat 5 times. Pull magic circle tight and tie off. I made my middle rose with 51 starting chains and my two side ones with 41 chains. Use tapestry needle to tie/weave these flowers and leaves onto your deer C2C banner in any order you see fit. I did mine with one larger rose in the middle and two of the medium roses on the sides. I put the leaves and tiny white flowers randomly around them. On my next go around of this pattern I may try putting flowers around the rack of the deer because I think that would be gorgeous! If you come up with some great flower designs for this Deer Banner please tag me on your instagram/facebook photos because I’d love to see what all you crazy creative people come up with! Use your base color and a tapestry needle to attach your banner to your stick or dowel. I just whip stitched around the stick and randomly through the top row of my banner. You can tie a piece of rope or string to the stick on either end to hang it, or attach it with eyelets for a cleaner look. Have you ever seen a cuter deer head hanging on the wall? This would make such a cute accessory for a nursery, or just hanging in a hallway or bathroom. Play with the colors and don’t be afraid to go “off pattern” every now and then! Maybe make him a little costume to drape on him for Halloween, or a Santa hat for Christmas time. The amount of ways you could play with this are endless. 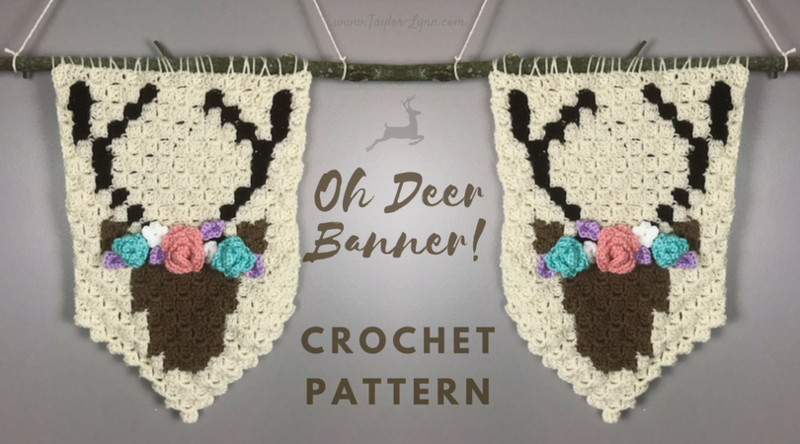 I hope you enjoy your new Deer C2C banner, I’d love to see how they all turn out! Also, if you would be willing, I would love for you to share your finished projects (and where you end up hanging them!) on my blog’s Facebook Page! Or if you post on instagram tag me (@TaylorLynnCrochet) so I can see how awesome they turned out! The social media icons in my header and side bar are all linked right to all of my accounts! Thank you so much! If you have any suggestions for future or tutorials please comment below! I have been trying to make your awesome pattern but it seems every time I get to the head, the pattern just doesn’t line up and it becomes a deformed head, after finishing row 17. Am I misreading the pattern? 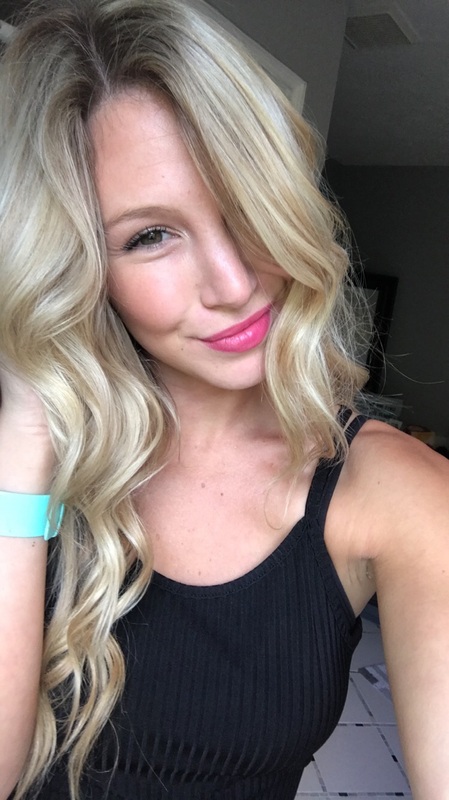 Hi Allie! Can you send me a photo of where you are at via email? That way I can better help you!